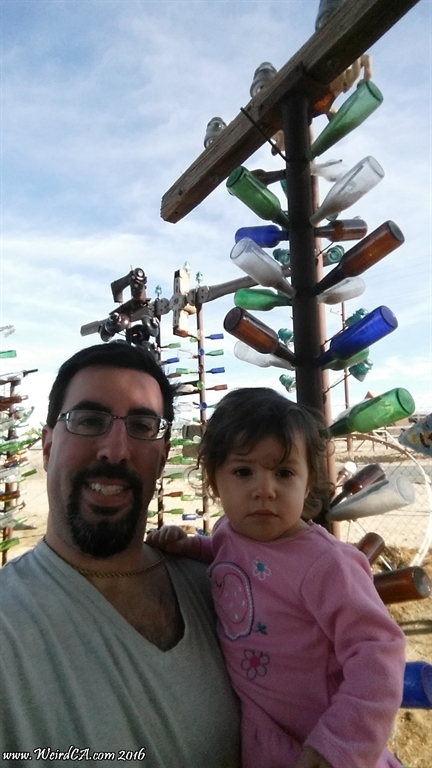 Elmer's Bottle Tree Ranch has over 200 bottle trees! If on your way out to Las Vegas along Interstate 15, you take a side road, along the old Route 66, you'll pass by Elmer's Bottle Tree Ranch. Out in the desert, Elmer Long has literally built a forest of what is referred to as bottle trees. Each tree is a large metal pipe with various bottles, often of different colors, hanging off the pipe's "branches". Elmer opened up the Bottle Tree Ranch in 2000 in the small town of Oro Grande, and is made up of over 200 trees and other assorted "art" installations. When Elmer was a kid, he and his father use to collect objects out in the desert and after his father passed away he built the Bottle Tree Ranch out of what they had collected, most notably out of his father's bottle collection. A bunch of old signs adorn the outside fence that surrounds the bottle tree ranch greeting visitors as they park along Route 66. Signs range from a Coca Cola sign to a "Dead End" street sign, to both a cattle crossing sign and a turtle crossing sign, as well as a "Barstow City Limits" sign. Additional signs include a Long Beach Boulevard street sign, a "Passing Permitted" sign, a "Slow" street sign, as well as the normal signs advertising the Ranch and welcoming visitors. The majority of the "trees" have something on top of them sorta like a star on a Christmas tree. These tree toppers range from a lamp or pitcher to an actual rifle and other guns. Animal skulls, fans, bells, and other things top the trees. Additional items litter the ground in the bottle tree forest including an abandoned jeep, a bathroom sink, metal sculptures, a boat and other things most people might describe as junk. Elmer Long can often be found hanging out in his forest, greeting his visitors and talking to them. He has a long white beard and is over joyed to see people visiting his folk art. His sons have stated that they will take care of the upkeep of the Ranch after their father passes. Elmer's Bottle Tree Ranch is located on Route 66 (this part of the famous road is also referred to as the National Trails Highway). This stretch of Route 66 provides an alternate route to Interstate 15 from Victorville northeast to Barstow. 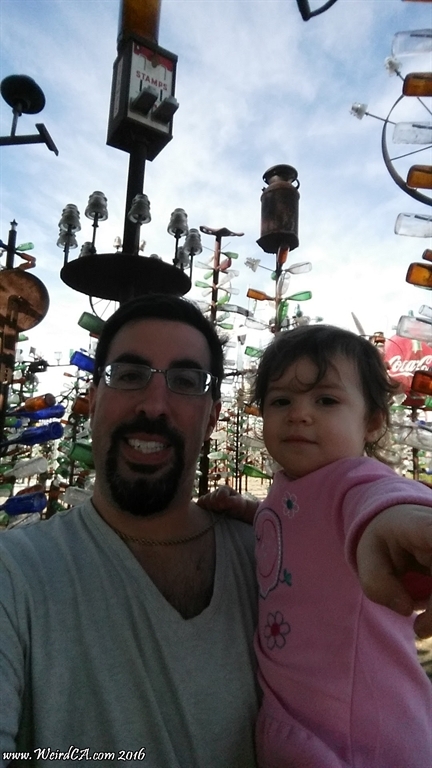 It is free to enter and wander around the Bottle Tree Ranch although Elmer does appreciate tips.